It’s perhaps even more beautiful in winter, when it has the stage more or less to itself. 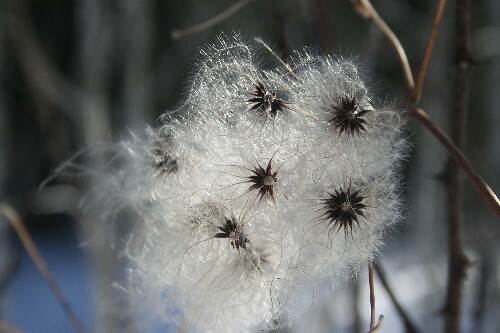 The seedheads are designed to be functional, not attractive, but they do both well. The long, feather-like plumes can catch the wind and be carried some distance from the parent vine. They lack tendrils and so grow like beans, rather than peas, weaving through and around their supports. Though they’re typically fond of moist or damp soils near areas with water, they’re pretty tolerant of a wide range of conditions, and will happily grow in a garden. They make a great addition to a native wildlife garden, providing food and cover for birds and other critters. The flowers are popular with native pollinators. Goldfinches may even use the downy seedheads in their nests in areas where they nest into the fall (goldfinches are a late-nesting species, only just getting started when most other birds already have fledglings out of the nest). Many places sell Wild Clematis seeds or plants, but it’s probably just as easy to go out and collect your own seeds if you know where some grows in your area (if not, send me an SASE and I’ll mail you some!). The vines are perennial and can eventually reach 10 to 20 feet tall in good conditions. They’re apparently easy to grow from seed, though one site notes that they’re slow to germinate. I’ve collected a few and think I’ll try sprouting them myself this year. Oh yes, Virgin’s Bower is a lovely plant in every season. 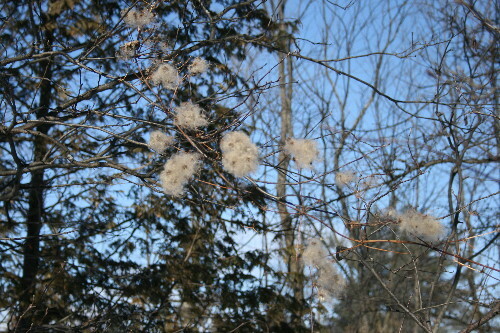 In winter, because of its hoary seedheads, it acquires the other common name of Old Man’s Beard. Our honeybees are quite fond of these during bloom-time. I see them along the roadside and they attract quite a hubbub! I have seen these as well and now, I know what they are. Just outside of Portland, Oregon, I once saw a vine so thick, it sort of looked like a waterfall coming from the top of a tree. Thanks for your post. beautiful photos, however i have been having problems with virgin’s bower on the bank of a local brook…it is completely smothering other native species along the banks…may not want to spread it around…. 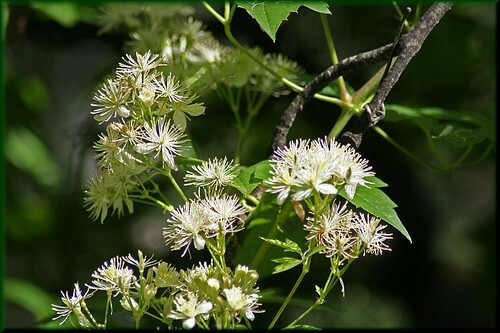 Virgin’s bower (Clematis virginiana) is a North American native clematis that produces legions of flowers, each of which can form a dozen or more wind-blown seeds. Though many birds and small mammals eat these, many escape to germinate. Their roots are composed of a mass of tough fibers spreading from the bottom of the stem. When pulled up, these roots break and, like most other invasives, produce new buds. The plant completely covers and smothers its host which dies and falls to the ground carrying the bower with it. On the ground, the bower stems roots and dozens to hundreds of new stems begin their search for hosts on which to entwine and reach for sunlight. Love the virgin’s bower (though yes, it does tend to smother my conifers, I have to keep an eye on it). It blooms here in NJ in September, so late summer. I’ve never seen birds, butterflies or bees on it, just syrphid flies and a moth. When I first moved into a prior house a few years ago clematis was all over the place on the side of the house. Later in the year I started to remove it and found a fully grown red maple tree underneath! Since then I’ve moved but I’m still terrified of finding the stuff.